Our thoughts continue to be with the people of the Gulf Coast, as they start to recover and rebuild from Hurricane Harvey. The Hurricane turned out to be one of the most damaging natural disasters in U.S. history, dropping an estimated 27 trillion gallons of water on Texas and Louisiana. Harvey’s environmental impact is among the many consequences felt by residents. While many are still displaced, they are also dealing with all manner of air and water contamination from damaged petrochemical infrastructure. The cleanup has only just begun. In the days since the Hurricane, we have been examining a wide variety of satellite imagery and datasets to help us try to understand the scope and environmental consequences of this catastrophic storm. So far we have seen multiple drilling sites, and possibly drilling-related fluid impoundments, that have been inundated by floodwaters. 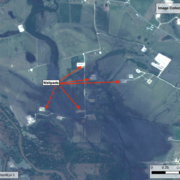 It is highly likely that any drilling chemicals held in the impoundments have escaped into the floodwaters if those impoundments were submerged. 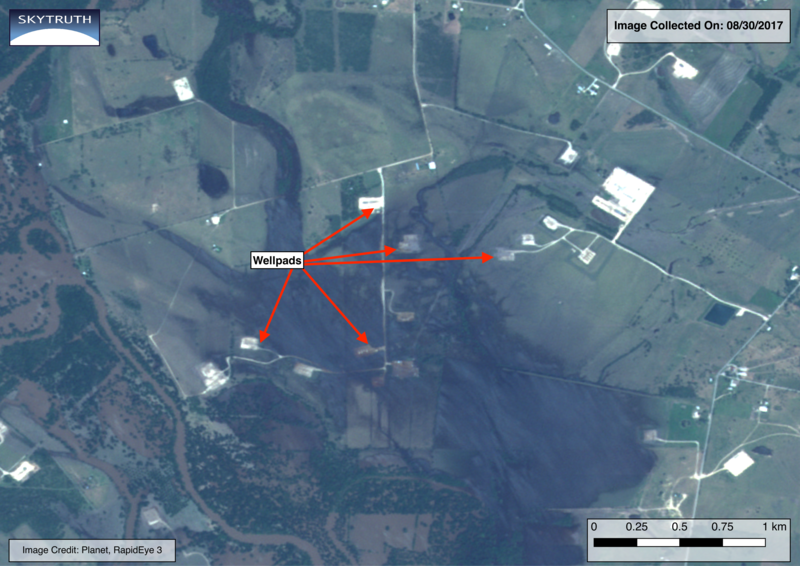 Here are a few examples, looking at four locations along the Guadalupe River near Hochheim, Texas. Index map showing the examples of flooded drilling sites below. All of the examples are from RapidEye 3 satellite imagery collected on August 30 and made publicly available by Planet thanks to the International Disaster Charter. Site 1. A flooded drilling site (well pad) and possibly a flooded drilling-related fluid impoundment, 1.7 miles northwest of Hochheim. The nearest home is about 400 yards from the impoundment. 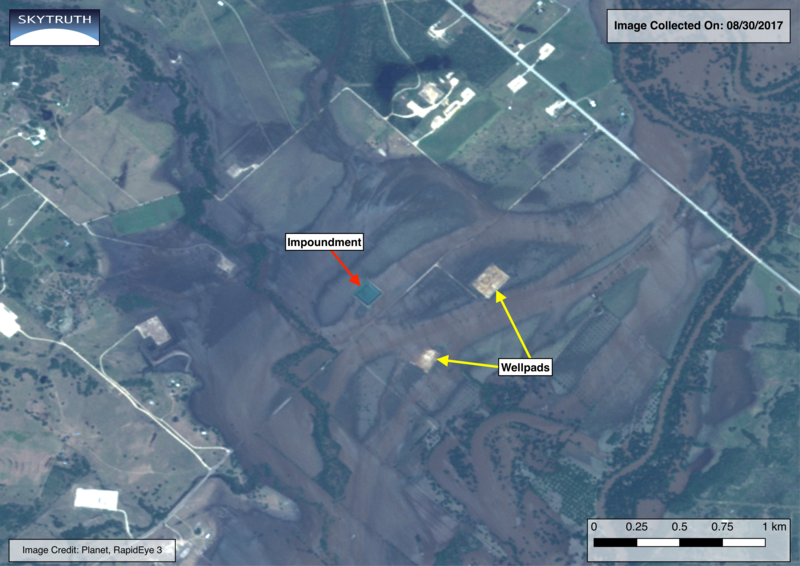 A low berm around the impoundment may have prevented floodwaters from entering. The operator for the wells at this site is EOG Resources, Inc.
Site 2. 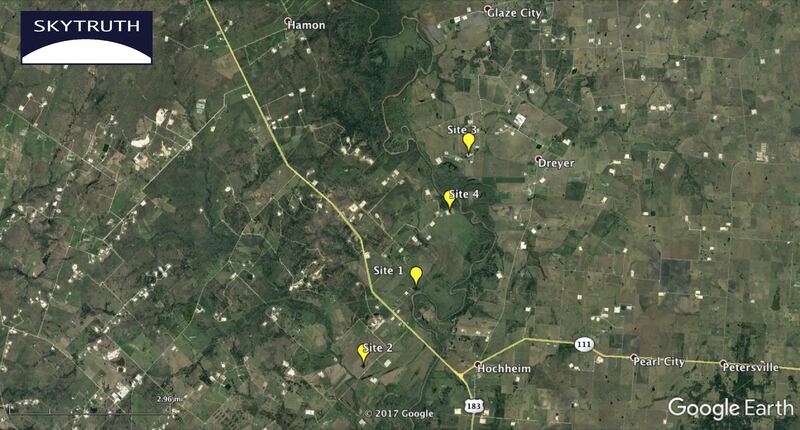 Four flooded drilling sites and possibly a flooded drilling-related fluid impoundment two miles west of Hochheim. 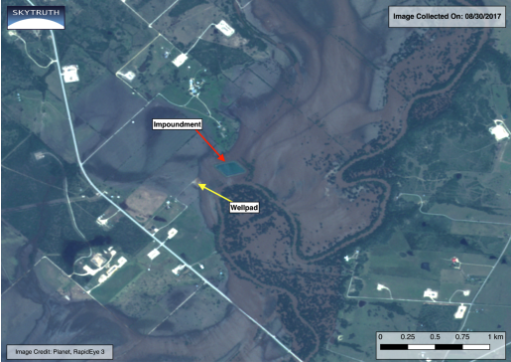 A low berm around the impoundment may have prevented floodwaters from entering. The operator for the wells is Burlington Resources O&G Co. LP. Site 3. Multiple flooded drilling sites approximately 1 to 1.25 miles west of Dreyer. The color of the flood waters here suggests a possible oil or chemical spill. The operator for the wells connected to this site is EOG Resources, Inc.
Site 4. Multiple flooded drilling sites approximately two miles southwest of Dreyer. The operator for the wells is EOG Resources, Inc.
Drilling in floodplains is a risky thing to do. Placing storage tanks and open fluid impoundments in flood zones is especially ill-advised. Reports of oil spills caused by flooded storage tanks that have floated off their foundations suggest new regulations need to be enacted to ensure tanks are firmly anchored to their foundations. We saw similar incidents after the flooding along the Colorado Front Range a couple of years ago. Operators, please tie down those tanks! 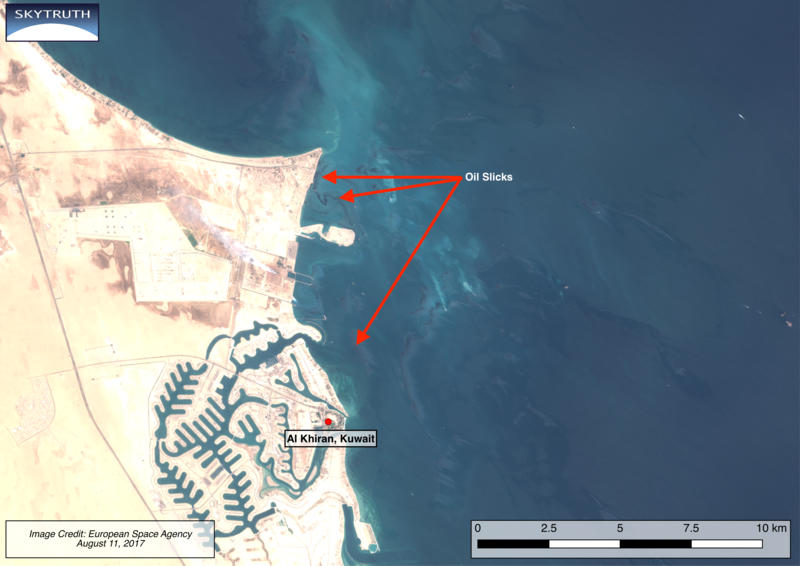 A large oil spill was reported on August 10th off the southern coast of Kuwait near the resort community of Al Khiran. 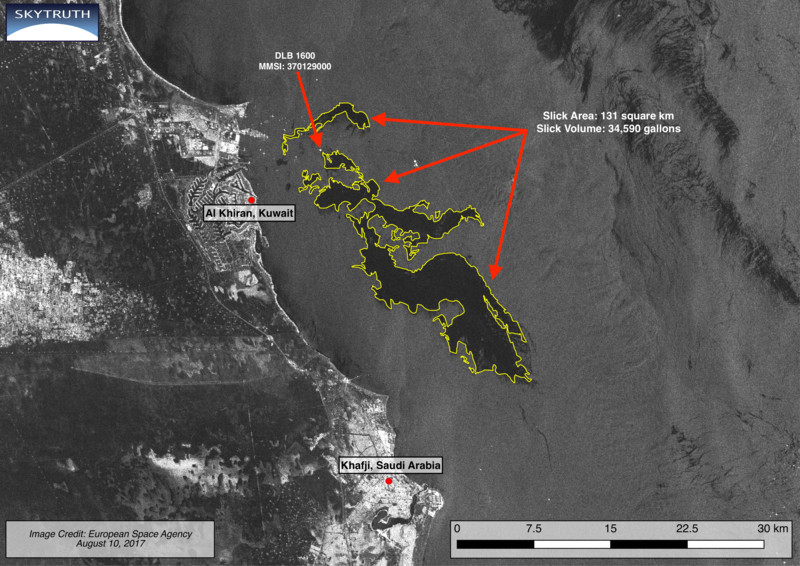 Sentinel-1 satellite imagery collected on the day of the spill shows a slick that covers 131 square kilometers. Based on our conservative estimate, assuming the slick is on average only 1 micron (1/1,000th of a millimeter) thick, this slick holds at least 34,590 gallons of oil. Early media reports of 35,000 barrels (=1.47 million gallons) seem far too high, based on how quickly the spill broke up and dissipated. 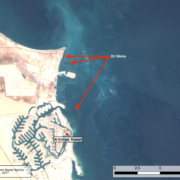 Sentinel-2 multispectral satellite imagery collected on August 11 shows oil washing up on shore near Ras Al-Zour just north of Al Khiran, and Sentinel-1 imagery collected on August 14 shows remnants of the slick drifting along the coast to the north of Ras Al-Zour. 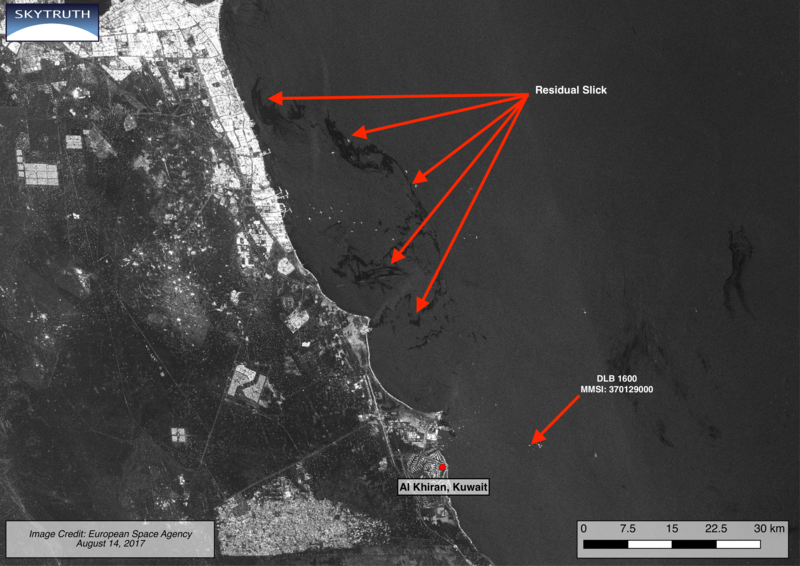 Sentinel-1 radar satellite image from August 10, 2017, showing oil slick off Kuwait’s coast. Slick covers 131 km2 and contains at least 34,000 gallons of oil based on minimum thickness assumption of 1 micron. Location of pipelay vessel DLB 1600 indicated. Image courtesy of European Space Agency. While the source and cause of this spill is uncertain, some have suggested it originated from a tanker offshore. Other reports speculate it is linked to the Al Khafji offshore oil field being developed by Kuwait and Saudi Arabia, which has pipeline infrastructure which runs to the shore. Operators deny the spill originated in their field. At the same time the slick started, a pipeline laying vessel, the DLB 1600, was moving through the area. AIS data reveal this huge offshore construction vessel has been slowly moving eastward towards the infrastructure in the Al Khafji field for the past week, and on the 10th the DLB 1600 is visible on the Sentinel-1 image near the north end of the slick. One possibility we haven’t seen mentioned yet is the pipelay operation damaged some existing infrastructure on the seafloor — for example, an old pipeline still holding crude oil. The potential for anchor-dragging by the pipelay vessel to cause this type of damage is mentioned in this article describing plans to upgrade the DLB 1600 by installing dynamic thrusters; we don’t know if this upgrade has been implemented yet. By the 14th the DLB 1600 had closed to within 9 km of the Al Khafji field. Sentinel-2 multispectral satellite image showing oil slick making landfall along Kuwait’s coast near Al Khiran on August 11, 2017. Image courtesy of European Space Agency. 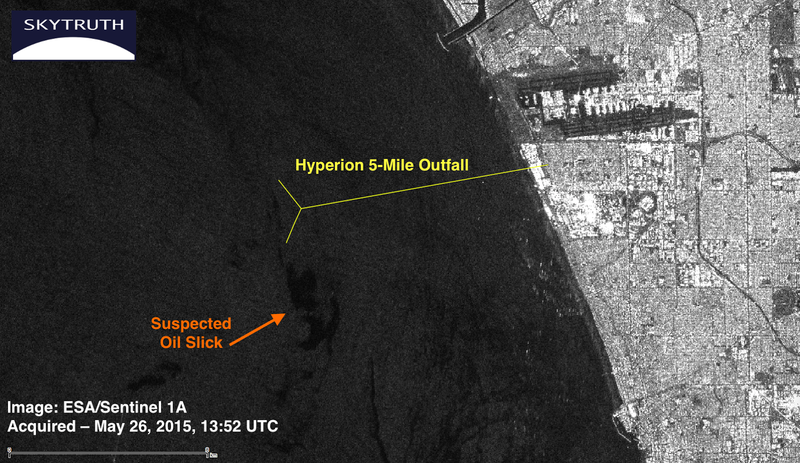 Sentinel-1 radar satellite image taken on August 14, 2017, showing remnants of oil slick off Kuwait’s Coast. Location of pipelay vessel DLB 1600 is indicated. The vessel moved several kilometers to the east compared to its position on August 10. Image courtesy of European Space Agency. 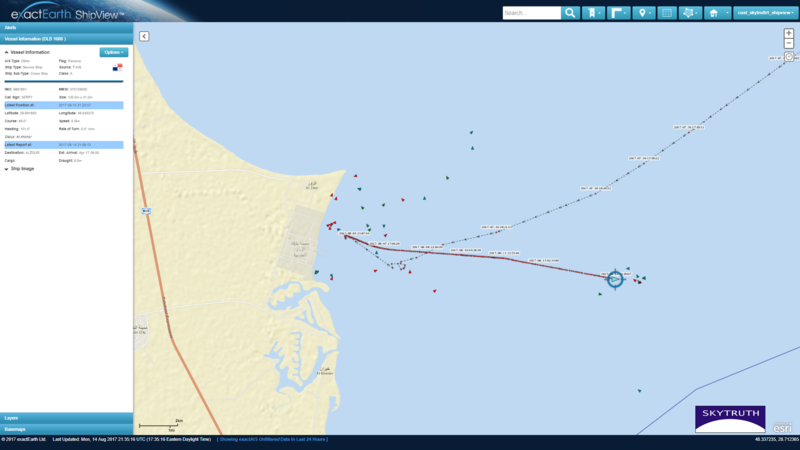 AIS tracking map showing the movement of pipelay vessel DLB 1600. The vessel has been moving slowly eastward since August 5, probably installing a new pipeline on the seafloor. A second slick north of the first spill was reported today not far from where a huge $30 billion new oil complex is being built. Check out Business Insider’s short video for more context. We will update this post as new information becomes available. In late June devastating flooding hit many communities across southern West Virginia resulting in over 20 fatalities and complete destruction of homes and businesses across the Mountain State. Because we are located in West Virginia and have been studying mountaintop removal (MTR) coal mining across Appalachia, we’ve received a number of questions about what role MTR mining may have played in this recent disaster. Depending on the amount of mining in the impacted watersheds, the quality of existing baseline data, and the number of measurements taken during and after the flood, scientists may not find a “smoking gun” directly linking the severity of this flood event with MTR mining. But let us take a look at what we do know about the relationship between flooding and MTR mining. If you are familiar with stormwater runoff issues then you have probably seen a diagram like the one above. Soil and vegetation absorb water. Impervious surfaces, like rock and pavement, do not. Since blasting off ridge tops to reach seams of buried coal strips the mountains of soil and vegetation, it seems logical that MTR mining would contribute to more intense flash floods. But even after decades of study there are a surprising number of gaps in our understanding of exactly how mining alters flooding. Research conducted so far suggests that MTR mining can contribute to greater flooding during intense rainfall events, but some studies actually found less severe flooding in watersheds with mining. Several of these studies suggested that valley-fills and underground mine workings have the ability to retain water, which may account for less severe “peaks” during moderately severe storms. If you want to dig into the details, I recommend starting with the summary of hydrological studies on MTR contained in Table 1 of this paper by Dr. Nicholas Zegre and Andrew Miller from West Virginia University. What most of these studies have in common is that the researchers must at least know where mining occurred and how much surface area was impacted by said mining. This is where our work here at SkyTruth comes into play because we’ve been mapping the when, where, and how much of MTR mining for over forty years. Thanks to a satellite record going back to the 1970s, SkyTruth can look back in time to measure the footprint of mining in Appalachia. We continue to make this data freely available for research, and so far our decade-by-decade analysis has been cited in at least six peer-reviewed studies on the environmental and public health impacts of MTR. These studies investigate everything from the increased risk of birth defects and depression to impacts on biodiversity and hydrology. But clearly there are still many unanswered questions left to research. 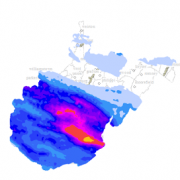 Precipitation on June 24, 2016, as measured by WV DEP. 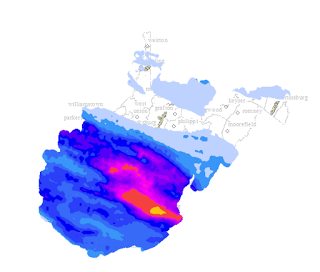 Finally, it is worth noting that much of the rainfall (left) was concentrated on Greenbrier County, a part of the state with relatively little MTR mining. Neighboring Nicholas County, however, does have some large mines so it may be possible for hydrologists to diagnose and measure the difference in flooding between mined and unmined watersheds which received equivalent rainfall. But that will take time to decipher and analyze. In the meantime, SkyTruth and our partners at Appalachian Voices and Duke University are working this summer to update and refine our data about the spread of MTR mining in Appalachia. The resulting data will allow more comprehensive and more accurate research on the effects of MTR mining. Our vision is for this research and resulting studies on the impacts of MTR to lead to better decision-making about flood hazards, future mine permits, and mine reclamation. 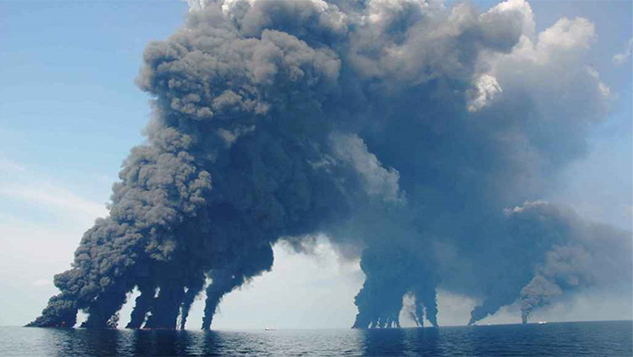 Within a day of the April 20, 2010 explosion on BP’s Deepwater Horizon drill rig in the Gulf of Mexico, we began our high tech surveillance of the spill. 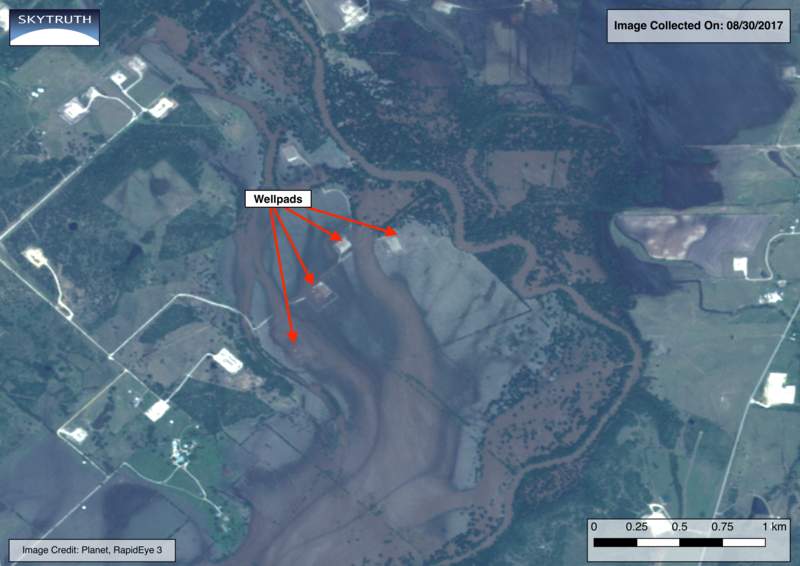 Examining satellite images and aerial survey data, SkyTruth quickly became a leading source of independent, unbiased information on the size and scope of the disaster. 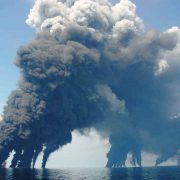 It was the largest oil spill in the nation’s history, releasing almost five million barrels of oil into the Gulf of Mexico. As bad as it was, it could have been even worse. Had BP continued to downplay the extent of the disaster, delaying mobilization of the appropriate response, it may have taken even longer than the 87 days it took to cap the well. Our work challenged the official story, spurred government science agencies to get off the sidelines, and opened a public dialogue about the magnitude of the risk posed by modern offshore drilling.. Throughout the spring and into mid-summer of 2010, as BP’s disabled well continued to pump oil into the Gulf, SkyTruth president John Amos was quoted in hundreds of news reports, and his interpretation and analysis of the raw imagery helped policy makers, the press and the general public make sense of events as they unfolded. SkyTruth also played a vital watchdog role. One week after the accident, we raised concerns that the amount of oil spilling into the Gulf was likely much higher than the 1,000 barrels-a-day estimated by BP and repeated by government officials. The New York Times and other media outlets picked up the analysis published on the SkyTruth blog on April 27. The next day, government officials publicly broke ranks with BP and raised its estimate to 5,000 barrels a day, the amount we had initially calculated. While NASA and the governments of several foreign countries made their satellite images freely available, without organizations like SkyTruth to interpret those images, the public may have never known the true impact of the spill. Equally important, we invited people directly into the conversation. Tens of thousands visited our website, blog, Twitter and Facebook pages. During the first ten days of June, for instance, our Blog received more than 70,000 visits – 25,000 in a single day. Meanwhile, our Oil Spill Tracker site, deployed on the fly in the first days of the spill, allowed Gulf residents to act as citizen journalists posting commentary and observations, as well as photos and videos of oil awash on the beaches and petroleum-drenched wildlife. Oily globs close SoCal beaches – Where did they come from? Yesterday afternoon oily globs from an unknown source began washing ashore in Southern California, prompting officials to close Manhattan Beach, Hermosa Beach, and Redondo Beach. Reports say “tar-like globs ranging from the size of golf balls to footballs began washing ashore along a six-mile stretch of coastline.” The U.S. Coast Guard has yet to identify a source, but did confirm the material was a petroleum-based product. Last week a pipeline spill of over 100,000 gallons of crude oil west of Santa Barbara dominated the headlines, so there has been some speculation that this oil came from that spill. However, thanks to satellite imagery, we believe we have found a more likely source. This image was collected at 6:52 am PDT on May 26 by Sentinel 1A, a radar satellite operated by the European Space Agency. Lifeguards at Manhattan Beach first reported the “tar-balls” washing ashore around 12:30 pm PDT, approximately 30 hours later. The image appears to show an oily slick only six miles west of Manhattan Beach and covering approximately 1,000 acres of Santa Monica Bay. Sometimes we see bilge dumps from passing vessels (like this 90-mile spill off the coast of Angola), but this slick doesn’t appear to have any vessel associated with it and it isn’t the right shape. So we started looking for any infrastructure around Santa Monica that could be the source of this pollution event. That is when we found this map of the five-mile sewage outfall from the Hyperion Wastewater Treatment plant at Playa del Ray. Take a look at what the outfall pipe looks like on the bathymetry layer in Google Earth. To see if this pipe might have anything to do with our suspected oil slick we digitized the outline of the Hyperion 5-Mile Outfall and brought that into QGIS to lay on top of the imagery from Sentinel 1A. 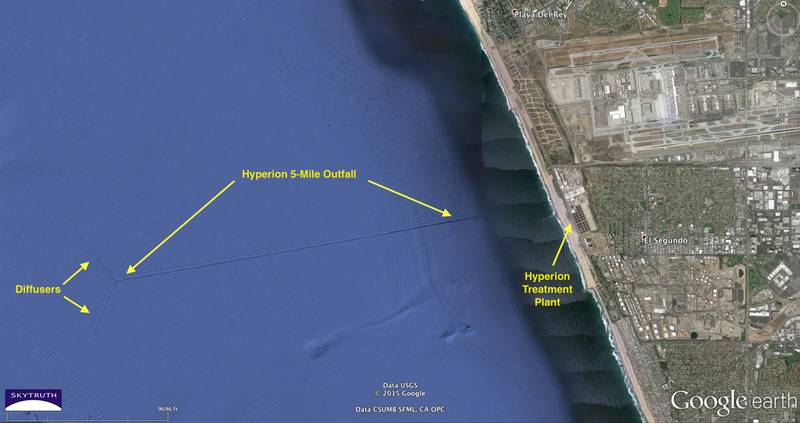 The southern diffuser leg of the Hyperion 5-Mile Outfall is less than 900 meters from the northern edge of the suspected oil slick. Given how close the slick is to the Hyperion 5-Mile Outfall, we believe this could be a source for the contaminants washing up on Manhattan, Hermosa, and Redondo Beaches. It is not impossible that tarballs from the pipeline spill at Refugio Beach State Park travelled over 100 miles to wash up en mass on these beaches, but it seems less likely than a discharge of some kind from the Hyperion Wastewater Treatment plant. Furthermore, we found more evidence which supports the notion that waste from the outfalls could reach shore given the right conditions. Back in 2006 the City of Los Angeles shut down Hyperion’s 5-mile outfall for inspection, diverting the wastewater to the shorter 1-mile outfall. 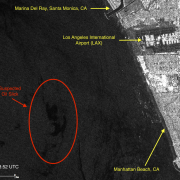 Scientists at the Southern California Coastal Ocean Observing System (SCCOOS) tracked the waste from the shorter outflow pipe and modeled the behavior of the plume. Bear in mind that the animation below shows the behavior of a pollution plume back in Winter 2006 from a point-source four miles closer to shore, but you can see how it is possible that waste from the outfalls could turn toward shore and contaminate the beaches. See more about the Hyperion outfalls at the SCCOOS website, and let us know if you have any additional information about this pollution event or the Hyperion Wastewater Treatment Plant. https://skytruth.org/wp-content/uploads/2015/05/Santa_Monica_Annotated-2.png 923 1600 David Manthos /wp-content/uploads/2016/08/test_logo.png David Manthos2015-05-28 19:50:002019-02-06 10:51:15Oily globs close SoCal beaches – Where did they come from?